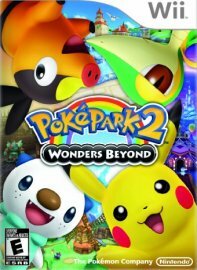 Unlike the previous game, you don't play as just Pikachu, instead being capable of playing through the areas as Pikachu, Snivy, Tepig or Oshawott. In the game, there are two main areas with several subareas; The standard PokéPark where the Pokémon dwell, and a new world called Wish Park, which is seemingly made out of cookies and cakes and has an odd aura around it causing Pokémon to act strangely. In the game, Pikachu and Piplup learn of the Wish Park, and visit there, only to find the Pokémon getting attacked and Piplup getting left behind. Pikachu then has to team up with Oshawott, Snivy and Tepig to try and bring calm to PokéPark and to stop the evil that is afflicting the Wish Park. There are also numerous items to collect, many of which you can trade with other Pokémon to obtain. This allows you to continue going to many areas so you can find every one of the 40 items in the game.